Looking for a fun and delicious way to celebrate the end of winter and support the Norwich Public Library? 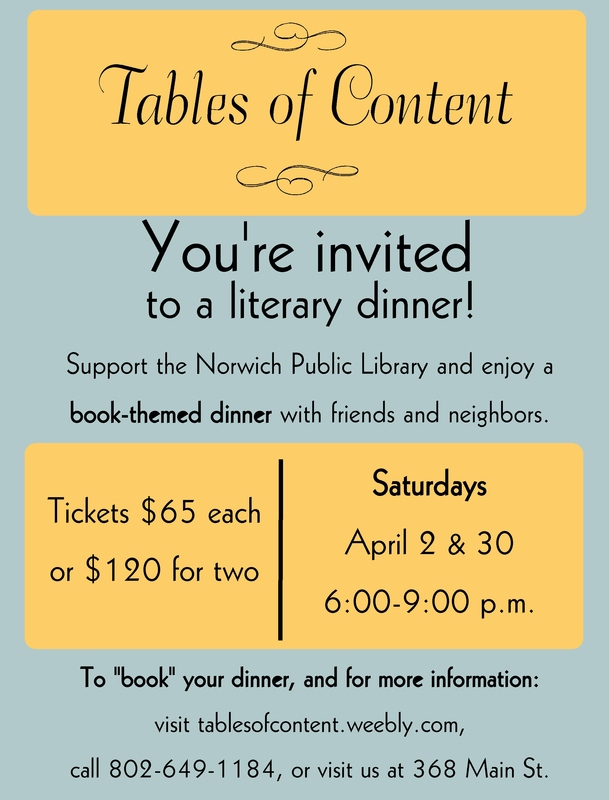 Please join us for Tables of Content, two evenings of literary-themed dinner parties. Dinner hosts from Norwich have selected a book as the theme for a dinner. Choose the top three books that interest you. The mystery is that you do not know who will be your host until one week before the dinner. What isn’t a mystery is how much fun you will have! The dinner dates are Saturday, April 2nd and Saturday, April 30th. Tickets are $65 for one, or $60 each for two or more guests. Visit the Tables of Content website for more information and to book your table today!